I’m sick to death of revision and it’s not even me that’s doing it! Just the sight of books strewn across the kitchen table with the wind pounding on the window – glum. I think it maybe subconsciously takes me back to my own struggles. Mind you, I seem to remember revising on the beach in a teeney weeney bikini during a heatwave………..now that’s how to do it. Sadly, this attitude was reflected in my grades and teeney weeney bikinis are a dim and distant memory. I think perhaps the moment for Nasturtiums has passed but I forgot, at the time, to blog this one. I am trying to finish paintings and being impeded by a frozen shoulder. As far as I know, there is nothing to be done except wait it out but if anyone has any brilliant remedies, I’d be glad to hear them. In the meantime, the studio is coming on a treat with all the insulation and plasterboard in – just need some lights now. Brrrr. The weather is definitely changing – winter is coming and thoughts turn to Christmas. It’s time to start painting clementines, figs and pomegranates. I just need to get through to next weekend and Windsor and then I can make a start on those and Chrismas commissions. At the moment I am painting large for the fair and I can start showing you those soon, once they’re dry enough to photograph. In the meantime, the new studio is getting warmer by the minute as Joe is insulating it to within an inch of its life. I may move in altogether. Same plums, different approach. It’s a hive of activity here with me painting in the attic, my son fitting out my studio for me and my daughter revising for GCSE mocks, poor thing. Just in case she’s having too much fun, I’m taking her to the dentist later………..bless. As I’m in the mood for reviews this week, if you’re heading up to the north lakes, a great place to stay isHawksdale Lodge near Dalston (www.hawksdalelodge.co.uk) – a lovely house with fantastic views, great hosts and……….some of my paintings. Just running out of the door and realized that I didn’t post yesterday. I was busy trying to catch up and finishing off a large painting. The house is full as it’s half-term so that completely threw me too. Off to London today with my daughter to see the Pre-Raphelite exibition and a play called Jumpy which has great reviews. Last day before I head off west and I’ve got a fridge full of things to be painted from other people’s gardens. Borlotti beans, beetroot and damsons and no time – I need a Lance Armstrong cocktail. Anyway, just finishing off a large painting – not for this weekend it would be wet!! 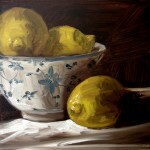 Here are some lemons until next week. I’m still beavering away – hardly seen the light of day and living out of the freezer – who’d have thought plums and fish fingers would make such a good marriage. Only kidding but I am working hard. Today I finished the painting for the Prince’s Trust sale of art at Windsor on November 9th. All participating artists in the fair are donating one and here’s mine. I’ve been busy lately working on larger works for upcoming exhibitions which is why the daily paintings haven’t been very………..well, daily. I’ve also been stashing them away and labelling, filling in forms, framing, wrapping, pricing and a hundred other jobs………you get the picture I’m sure. Here’s one that’s just gone in the box. If you are in the Northampton area, the Northampton Town and County Art Society private view is on Friday from 6pm at the museum. If you’re in Shropshire or thereabouts there is one at Ludlow Castle from 6.30pm. Until such time as I develop super-powers, I can only be at one and it will be Ludlow, would love to see you. 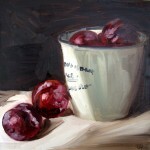 I am busy stashing paintings away to take to Ludlow next week and then Windsor in November. I will also have some at Edinburgh in November but more on that later. So, chop chop, busy busy…………… off to buy canvas this afternoon and see an Arthur Miller play afterwards! These are Forelle pears from good old Waitrose.